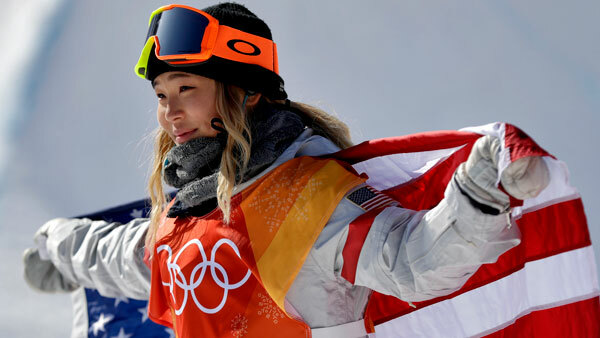 PYEONGCHANG, South Korea (WPVI) -- Gold medal already in hand and Olympic dream fully realized, Chloe Kim could have turned her third and final run in the women's snowboarding final into a victory lap. So she went for it. She had no choice. "I knew that if I went home with a gold medal knowing I could do better, I wasn't going to be satisfied," Kim said. That shouldn't be a problem. Kim turned her coronation into an exclamation point, stomping a pair of 1080 spins (three complete turns), then practically diving into a hug with American teammate and bronze medal winner Arielle Gold to seal a moment four years in the making. "I don't really know what's happening and I'm actually feeling a little anxious right now," Kim said. "I'm a little overwhelmed. But this is the best outcome I could ever ask for and it's been such a long journey. Ahhh, just going home with the gold is amazing." Competing in front of her extended family, a group that included her Korean-born parents and her South Korean grandmother, and apparently on an empty stomach - she actually tweeted during the competition that she was "hangry" after failing to finish her breakfast sandwich - Kim put on a show that delivered on her considerable pre-Olympic hype. She put together a 93.75 during her first run, one that included just one 1080, not the two that have become her trademark. No matter. The perfection-flirting third run provided a cathartic exclamation point. "I knew that I did put down a really good first run, but I was also like, 'I can do better than that. I can one up myself,'" Kim said. Liu Jiayu took silver with an 89.75 to become the first Chinese snowboarder to medal at the Olympics. Gold, who pondered retirement last summer, overcame a dislocated shoulder suffered during training to edge teammate and three-time Olympic medalist Kelly Clark for third. Kim's parents were born in South Korea and moved to the United States, putting their daughter in an interesting position heading into her first Olympics. While she understands the urge to build a narrative around her that turns her into a connective tissue of sorts between the host country and the one she calls home, it's one she has politely sidestepped. She views herself as just a kid from Torrance, California, who likes music, the mall, ice cream and, oh, by the way, putting down the kind of gravity-escaping, physics challenging runs that have made her a dominant force in her sport. Standing atop the hill at calm and brilliant Phoenix Snow Park - a stark contrast to the windy mess that turned the women's slopestyle final into an ugly, borderline unsafe and crash-filled mess 24 hours earlier - Kim looked down at the crowd that included her parents, three sisters, three aunts, two cousins and her grandmother Moon Jung ae and proceeded to waste little time while turning the final into a global coming-out party. She drilled her opening set, throwing in a 1080 - basically, three twists high above the pipe - before following it with a pair of flips (or "corks"). Kim celebrated at the end, pumping her fists as "USA! USA!" chants rained down. When her score flashed, she clasped her hands atop her head and drank in the moment. Kim's teammates made serious bids to give the Americans only their fourth-ever Olympic podium sweep. Gold, who dislocated her right shoulder during training for the Sochi Olympics and didn't compete then barely made the 12-woman final, brushed off a fall during her first run and stomped an 85.75 on her third run. Clark, the 2002 Olympic champion still going strong at age 34, couldn't quite catch Gold with an 83.50. Liu came the closest to providing Kim with a serious threat. She threw down a 89.75 during her first set to take the lead, only to watch Kim top it during her first run moments later. Liu then washed out on her last trip down the longest Olympic halfpipe since the sport made its debut in 1998, turning Kim's last run into a victory lap. Rather than playing it safe, she went for it. Her No. 1 bib soaring into the South Korean sky, she put on a display that left the rest of the field and the thousands packed near the finish roaring their approval and vaulting her to a level of stardom she's not quite sure she's prepared for. Kim is well aware she'll become a role model for other Korean American kids whether she wants the role or not. She'll figure it out as she goes. "The one thing I learned was just give everything a shot," she said. "You don't want to live in regret. I feel like no regrets is the best way to go."